NASA plans to announce a new discovery by its Hubble Space Telescope Wednesday (Dec. 12) that will shed light on the evolution of the early universe, officials said. Scientists "will report on recent observations of a previously unseen population of primitive galaxies that formed more than 13 billion years ago," NASA officials wrote in a media advisory Monday (Dec. 10). The findings will be revealed during a teleconference with reporters Wednesday at 2 p.m. EST (1900 GMT). Astronomers believe the Big Bang that created our universe occurred about 13.7 billion years ago. 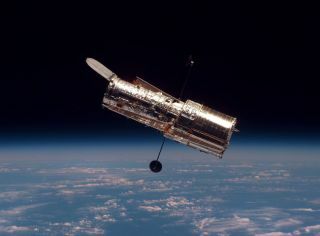 The iconic Hubble Space Telescope is a joint operation of NASA and the European Space Agency. The instrument has made more than 1 million science observations since its launch in April 1990, and it's still going strong.